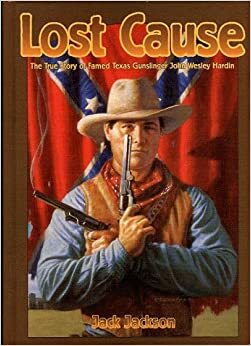 I started reading Lost Cause by Jack Jackson a long time ago and refused to review it because a character named Hays, who I thought was meant to be one of the good guys did something really racist. It rubbed me the wrong way. I recently gave it another try and realized that the character was one of many villains in the book. I decided that since it's history and non-fiction, it deserved a chance. The story follows the terrible, bloody feud between the Taylor and Suttons. The famed Texan gunslinger, John Wesley Hardin, plays a crucial role. He lived 42 years and killed about 40 people. Just to be clear, I love Westerns, but lots of things in this one are way too complicated and confusing. I can never tell who are supposed to be heroes and who are supposed to be villains. Sometimes the Taylors are the good guys and sometimes their enemies are the good guys. I know that this is the story of real people, but I can never tell why I'm supposed to sympathize with them. A lot of the time the things they do seem completely unredeemable. To be fair, there are some good parts in the book. I do like the beginning when the Civil War is happening, I also like the time during the presidential election of 1868. They add an extra layer of conflict to the mix. The parts I don't like are the millions scenes where people are caught illegally branding cows, then get hung. These scenes could have been represented in one page instead of constantly throughout the book. The art is very detailed and in depth. I really like how the animals are drawn. They look extremely realistic. One strange thing I noticed was that all the characters have such expressive faces except for the most important characters. People like John Choate, a middle aged rancher who joins up with the Taylors for a few pages, have faces filled with emotion, whereas Wes Harden has one expression, which is blank. Lost Cause is definitely not appropriate for all ages. There are some very bloody scenes and a lot of people die fairly terribly. One guy who tries to steal Wes's horse is shot in the chest and left to bleed out. It deals with dark subjects like family feuds and racism. It also uses a very strong word that begins with n. If books had ratings, it would be rated R. I would give Lost Cause 3 Mexican standoffs out of 5. Hello, Milo. I'm Patrick. I was a long-time subscriber to your mother's zine. I wrote a very long response to your review and my iPad ate it, so I'm going to attempt the same on my computer. I just finished reading "Los Tejanos and Lost Cause" myself and I wanted to respond to some of the things you address in your review. Jack Johnson has a long history with comics, going back to the 60s and the underground comics scene. He wrote a comic called "God Nose" that was contemporaneous with Robert Crumb and the early San Francisco underground comics scene. Johnson has a history with tough subjects and he does not shy away from using language that you correctly assess as being "R-rated." Johnson addresses the use of this language in the sources section of the book. In terms of historical accuracy, it is accurate to the times to use this. Johnson examines a period of history that often gets glossed over in the Texas history state-sanctioned curriculum. I should know. I was required to take it in middle school. As to the expressionless face of John Wesley Hardin, Hardin was a notoriously brutal killer and few photographs of him exist. Knowing of Johnson's desire to be historically accurate, the face might have been drawn from source material like tintypes or daguerrotypes that typically had blank-faced subjects. I think Johnson is simultaneously trying to show the brutality of his subjects and to be accurate to the look of the times. Johnson really does us a favor by helping us to see how wrong-headed and backwards certain attitudes were. You speak in terms of there being "good guys" and "bad guys." In that time period, I don't think there were too many good guys at all, and we are lucky as a nation to have survived that time. As a native Texan, I think Johnson paints a very real portrait of the problematic nature of what it means to be Texan and by all accounts, an American.